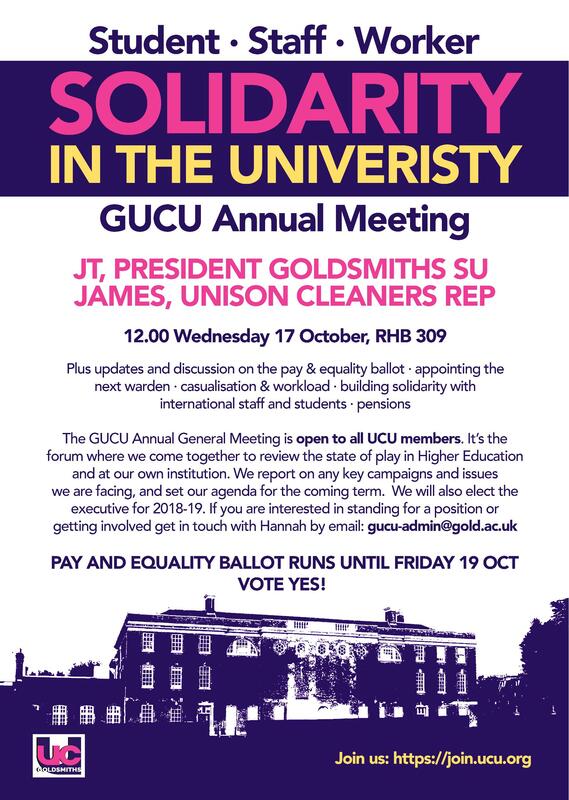 The GUCU Annual General Meeting is open to all UCU members. It’s the forum where we come together to review the state of play in Higher Education and at our own institution, report on key campaigns and issues we are facing, and set our campaigning and industrial agenda for the coming term. We will also elect the executive for 2018-19. If you are interested in standing for a position or getting involved get in touch with Hannah by email gucu-admin@gold.ac.uk<mailto:gucu-admin@gold.ac.uk>. Open to all UCU members – If you are not already a member – Join us!